Bri Seeley is an inspirational woman who supports women around the world to bring their visions to life. Bri is motivated by a deeply-held belief that every woman deserves to live a life that inspires her, and her work reflects this deep remembering of the possibility - nay, inevitability - that our desires hold. 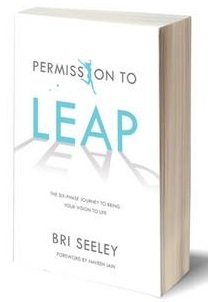 Through her book, podcast, and 6-month training, Permission to Leap will guide you through the process of leaping from the day you commit to the day you land softly on the other side. A catalyst, speaker, and author, she is a regular contributor for The Huffington Post and Influencive and is known by many for her tell-it-like-it-is, out-of-the-box guidance that creates massive and epic changes in every woman she encounters. Bri has been featured on NBC’s The TODAY Show, Forbes, Inc, Medium, PBS, and Free Enterprise. Bri received the Outstanding Small Business award from the Los Angeles Mayor's office and the Small Business Development Center in 2016. I help people bring their visions to life. It’s something that I’ve done for myself for two decades, and now I get to help others apply the tools and techniques to their own lives. My tenacity. If I receive a ‘no’ or a door closes, I move on to the next one. I find that “rejection” or “failure” can be huge stumbling blocks, but I have a perspective that the word ‘no’ simply means it’s not the right fit and a closed door means that it’s not the right opportunity. I do my best not to take it personally and, instead, keep moving forward towards my ‘yes’ and the open doors. As for my personal ambitions, I look forward to the day when I get to share my life with a man who wants to grow together. I desire to travel around the world on a regular basis - I want to have bases in Los Angeles, New York, Florence and Bali, as well as seeing what places like Easter Island, Greece, Spain, Tulum, Prague, and more have to offer! I want to be an amazing friend and maintain the powerful, loving relationships I’ve developed. I want to be the cool aunt if/when my sister decides that she wants a family. I want to reach and maintain optimal health and continue expanding my physical movement practice. As for business ambitions, I am in the process of building a 7-figure business for a few reasons: 1. I want to say, “I did that.” 2. I want to show other women what’s possible for them. and 3. I want to be able to influence policies and laws in our country which means supporting the right candidates, putting money into lobbying and having influence in the political sphere. I want to be a phenomenal, compassionate and empowering boss to my team. I want to speak all over the world and remind women what we are innately capable of. I want to inspire 5 million people to say yes to their own leap of faith. My biggest successes have been walking away from businesses, people and things that no longer serve me. When I closed my fashion brand, I spun into a deep, deep spiral of “failure.” I told myself stories about what a horrendous business owner I was, why I royally sucked and felt so much shame around it all. After a few months of inner work, I was able to heal my feelings of failure, shame and anger at myself, transforming my perspective into an understanding that this decision was aligned, empowered and the best for my future. It helped even more this year when I walked away from a second business. I never even looked at the decision to close this business as a failure. I fully trusted that it was exactly what needed to happen in order for my continual expansion. Being able to make big decisions about my present and my future without spiraling into doubt, shame and failure is a huge success for me. Entrepreneurialism is a journey. There will continue to be ups and downs, and the more I can view closures, outgrowing things and moving forward as a positive, the better. I would say that my most challenging moment is the same as my most successful moment. And it was in moving through the challenges that came with it that made it feel like such a success. I only have a certain amount of care to give everyday. So in order to make sure my energy and attention is going to the most important things I employ a very discriminating care / no care policy. I refer to this as my ‘Zero F*cks Given Policy.’ It helps me decide what I’m giving my care and attention to, and what I’m releasing. Usually the things that I give my care and attention to involve my business growth, clients, community and my health. While the things that I release my care around involve situations or circumstances that I can’t do anything about, thoughts or opinions that other people have of me, small mistakes (such as including the wrong link in a newsletter), what I wear, and things that don’t inspire me. My favorite people are the ones out there following and creating their unique path. I’m inspired by people who are saying YES to their vision and actively bringing it to life everyday. It’s what lights me up and what gets me out of bed each day. I am totally in love with Los Angeles. The vibe of this city is everything. I live in Downtown and have had the opportunity to see it transform before my eyes as the city center undergoes a full Renaissance and transformation. The energy is palpable. And I’m obsessed. I also adore Florence. Another Renaissance city that is filled with beauty, creativity and passion. You can’t turn a corner without being punched in the heart with complete awe. Last year I took my first trip to Ubud, Bali and totally fell for it’s magic. It is a divine place filled with the most beautiful people, rituals and history. I’m obsessed with Republic of Tea’s Hi-Caf Toasted Coconut tea. I drink it every morning (and even refill my cup with hot water!). I also love Fresh’s Black Tea serum for my eyes in the mornings. And my Soda Stream for keeping me hydrated without the plastic waste because I am not a fan of flat water! I am currently passionate about: my friends, my book, suspended yoga, Echo Park lake, my clients, quinoa porridge, new sneakers, Sense8, Lapis Lazuli, Downtown Los Angeles, my 2018 travel plans, fresh flowers, and I’m always excited about my kitties.